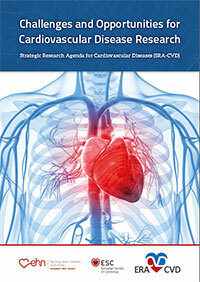 ERA-CVD has developed a Strategic Research Agenda for Cardiovascular Diseases (SRA-CVD) “Challenges and Opportunities for Cardiovascular Disease Research” which can now be downloaded as PDF-file. The SRA-CVD provides a general analysis of the European cardiovascular research landscape and outcomes as well as recommendations to guide research funders and deliverers of healthcare as they tackle and seek to reverse the growing burden caused by cardiovascular diseases. The External Advisory Board (EAB) of ERA-CVD has supported the development of the SRA-CVD. In addition, the European Society of Cardiology (ESC), the European Heart Network (EHN) and numerous specialists in cardiovascular research have strongly contributed to the SRA for Cardiovascular Diseases. The SRA-CVD has identified a list of 15 research domains for cardiovascular research. A prioritisation consultation is now launched in order to identify the most urgent health care challenges and research priorities. It is important that everyone in the cardiovascular field can participate, including health care professionals, patients and citizens, researchers, policy advisors, and people working in the biomedical industry. The results of this online survey will be incorporated as attachment to the final SRA-CVD document. The consultation will be open from April 15th and to May 31st, 2019. Ultimately, implementation of the proposed research agenda will require action from ministries, funding agencies, health care administrators and the private sector, at EU and national level. ERA-CVD urges the responsible ministries and funding agencies to take the lead in advancing this agenda at European level, for the benefit of the patients and citizens. Beyond the research agenda presented here, public and private decision makers should develop novel models for care, ensure equal access to treatment and implement digital health that will in turn support research for reduce the burden of CVD.